Maryland State Sen. Catherine Pugh (2nd from left), U.S. Rep. Elijah Cummings (D., Md. 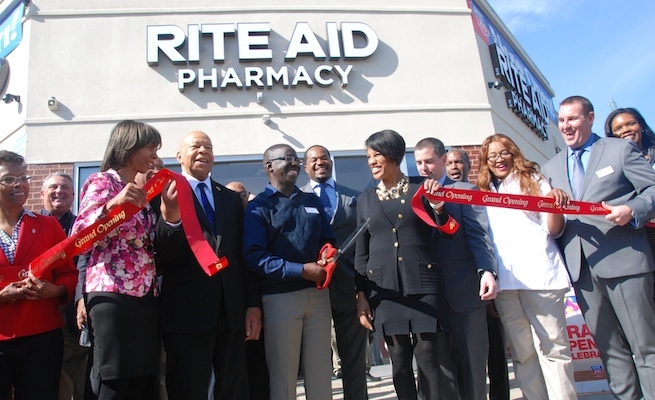 ), Baltimore Mayor Stephanie Rawlings-Blake (center) and Rite Aid EVP of operations Bryan Everett (far right) cut the ribbon to officially open the drug chain’s rebuilt Baltimore store. CAMP HILL, Pa. — Rite Aid Corp. is holding a ribbon-cutting event to mark the reopening of its store in Baltimore that was heavily damaged during the city’s riots in April. On Tuesday afternoon, Rite Aid executive vice president of operations Bryan Everett is slated to be joined by U.S. Rep. Elijah Cummings (D., Md. ), Baltimore Mayor Stephanie Rawlings-Blake and other city, state and community officials for a grand reopening ceremony at the rebuilt store, located at 300 Martin Luther King Blvd. Also expected to participate in the event are Maryland State Sen. Catherine Pugh, Baltimore City Council President Jack Young, Baltimore City Councilman Nick Mosby and University of Maryland School of Pharmacy Dean Natalie Eddington. The store has been operating out of a temporary trailer since May after sustaining significant damage during the protests. Besides prescriptions, the temporary facility provided a selection of over-the-counter medicines and everyday items, including snacks and beverages. Rite Aid had announced plans to rebuild the store on Martin Luther King Boulevard shortly after assessing damage to eight stores that had been closed temporarily due to damage from the rioting. Rite Aid said the rebuilt location features its Wellness Store format, which offers expanded pharmacy and clinical services, a larger assortment of health and wellness-oriented products and an enhanced design and store layout. The concept also features the Wellness Ambassador, a specially trained service associate who works closely with the pharmacists to provide customers with access to information on over-the-counter medications, vitamins and supplements, and Rite Aid programs and services. With the store’s reopening, The Rite Aid Foundation also will present a $10,000 donation to Bettye M. Adams, principal of The Historic Samuel Coleridge-Taylor Elementary School, located less than a half-mile away. The school serves nearly 500 students and plans to use the donation to help fund athletic equipment for physical education classes to help further the physical fitness and well-being of students. Overall, Rite Aid operates 30 stores in the city of Baltimore and another 70 stores in the surrounding area, employing about 800 associates.